Our whole family has loved using our iPad, and I've been thinking a lot about how children will use use the full color iPad for reading picture books. So when I heard about Scholastic launching three established picture books as iPod/iPad apps, I was intrigued. The Magic School Bus Oceans app is an example of how a publisher can take an established picture book and give it more depth and interactivity by adapting it to the iPad/iPod. If you have children who are interested in learning more about oceans, I highly recommend this app. We first grew to know the Magic School Bus when my children were in preschool through their lively PBS television show. The Magic School Bus books and television show help kids learn about science in a fun way - combining a story of crazy Ms. Frizzle, a teacher like no other, who takes her classes on field trips to see science up close, with clear scientific information. But I must say that at times I found the books too crowded and busy with information. It was hard to sit with young children and focus on particular text. The Magic School Bus: Oceans app draws children in with its bright colors and interactive design. Even better, it breaks each page from the book into chunks, showing a small part of text at a time. Then the reader swipes her finger across the page to read the next chunk. You tap speech bubbles to hear/read what each child is saying. If you tap an animal with a label, a screen slides down and gives you more information, including a photograph or video of that animal. This interactive design keeps kids interested and engaged, while not overwhelming them. My first grader found the app easy to negotiate and engaging enough to want to come back to it several times. She liked the way you can skip to different chapters within the book, or to the games included with the app. I wish that there was an option to turn off the narration, but keep the sound effects. I would recommend this app for kids ages 6 - 10. Younger kids with experience using apps and an interest in oceans might find it interesting, but I think it's perfect for 1st through 3rd grade students. Overall, this is a great way to share with children that iPad and iPod apps can be entertaining, engaging and educational - hey, the triple E effect! 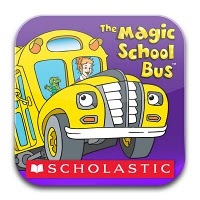 Here's hoping that Scholastic publishes more Magic School Bus apps! Many thanks to Betsy Bird, of Fuse #8 and the NY Public Library, for her helpful thoughts on what makes a great app for kids' picture books. See her great article in School Library Journal: Planet App - Kids' book apps are everywhere, but are they any good? for more thoughts on reviewing kids' picture book apps. The app was kindly sent by the publisher. If you make a purchase using the Amazon links on this site, a small portion will go to Great Kid Books (at no cost to you). Thanks for your support! Albert Einstein - quoted in the beginning of The Search for Wondla , by Tony DiTerlizzi. When I was a child of about 9 or 10, I used to pour over illustrated fairy tales like Andrew Lang's Red Fairy Book and Blue Fairy Book . My favorite was Old French Fairy Tales , by Sophie Rostopchine, Comtesse De Segur. These were long, complicated tales rich with illustrations that captivated me. 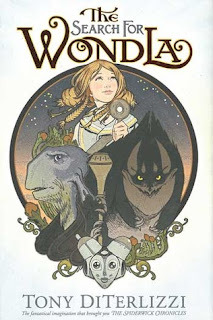 I was delighted recently to read Tony DiTerlizzi's newest novel, The Search for Wondla , a highly illustrated adventure which draws as its inspiration old illustrated fairy tales, modern quest stories and creates a richly drawn science fiction world. Young Eva Nine has grown up entirely within the confines of her underground Sanctuary, under the watchful guidance of Muthr, a robot charged with her upbringing. Now twelve years old, Eva Nine yearns to explore above ground and meet other humans. Her dreams are fueled by a scrap of paper that has the words "Wond" and the letters "L" and "a", showing a picture of a young child walking hand in hand with a robot - her "WondLa". But Muthr (pronounced "mother") insists that Eva must wait a bit longer so she is truly prepared. One day, the Sanctuary is attacked by a vicious beast and Eva escapes with only the clothes on her back and her Omnipod, a handheld computer device. Suddenly Eva is thrust above ground and must survive on her own. All around her are strange plant forms and living things which her Omnipod cannot identify. She meets Rovender Kit, a strange, blue creature who ends up becoming Eva's trusted friend and guide, and she is ruthlessly pursued by the beast who destroyed her Sanctuary. Together, Eva, Rovender and Muthr search this strange, fascinating world for other human life forms. Tony DiTerlizzi, author of the Spiderwick Chronicles, has created wonderful illustrations to highlight his richly imagined world. Each chapter begins with a double-page illustration that captured my interest. I actually listened to this as an audiobook, but each night found myself pouring over the illustrations in the book. In some places, I found the text did not provide quite enough description, as it assumed readers were also looking at the illustrations. But Teri Hatcher's narration captured the voice of Eva perfectly, combining an annoying Tween girl's attitude with her mother's restrictions, with her wonder and fear as she explored this new world. DiTerlizzi has also created an interactive visual map which you access online through WondLaVision. This intrigues some students, but I found it hard to break away from my reading habits, bring the book to the computer, and explore this world. Several students in my elementary school have started this but not finished it. Its length is definitely daunting. But for those who want to get lost in another world, I'd highly recommend this. Another excellent science fiction series is Mortal Engines , by Philip Reeve. Several of my 5th grade students have loved Fever Crumb and are thrilled that the Mortal Engine series is being re-released in paperback this spring. The review copy was kindly sent by the publishers. If you make a purchase using the Amazon links on this site, a small portion will go to Great Kid Books (at no cost to you). Thank you for your support. Many 5th and 6th graders I know love realistic fiction that explores how other kids are strong in the face of hard times. These kids on the brink of being teenagers know that life is not always easy - for them or others - and reading about others helps them know that we can survive. One book that will hook in lovers of realistic fiction is Out of My Mind . Melody Brooks has cerebral palsy and cannot speak; and yet, through this moving narrative, we come to know her thoughts, hopes and struggles. Imagine having all your thoughts and feelings trapped inside you, not being able to share them with anyone - your family, your classmates, your teachers, your friends. Melody writes, “By the time I was two, all my memories had words, and all my words had meanings. But only in my head,” she writes. “I have never spoken one single word. I am almost eleven years old.” Through this story, we hear how about Melody's journey, surely a difficult one, but with Melody's sense of humor and sheer determination, a journey that we learn more about what we might be able to do. Through the help of her parents and a devoted neighbor, Melody starts to use a communication board to communicate with those around her. This helps her integrate more with other students at school, and yet it is still a painful, difficult journey. Some have suggested that part of Melody's story are unrealistic, and yet I found that this story helped me develop more empathy for others trapped in similar situations. Soon after reading this, I sat next to a man on an airplane who had cerebral palsy and was traveling with his parents. Reading Out of My Mind helped me think about what he was going through but couldn't communicate with others. I particularly found Sharon Draper's thoughts on why she wrote this, especially reflecting on her experiences as a mother of a daughter with disabilities, interesting. If you like Out of My Mind , you might try Mockingbird , by Kathryn Erskine, winner of this year's National Book Award for Young People. Out of My Mind has been awarded the 2011 Josette Frank Award for Fiction by the Children's Book Committee at Bank Street College of Education. Review copy came from my home library. If you make a purchase using the Amazon links on this page, a small portion will go to Great Kid Books (at no cost to you). Thank you for your support. Soup Day, by Melissa Iwai (ages 2 - 6): Yummy, yummy good! Did you know that January was National Soup Month? It's a perfect fit; on these cold winter days, soup is the perfect comfort food. A wonderful book to bring home is Soup Day , by Melissa Iwai. Inspired by her experiences cooking with her own son, Melissa Iwai has created a sweet picture book that you'll love sharing with your children. One snowy winter day, a little girl and her mother decide that it's the perfect day for making soup. They first go to the market to pick out vegetables together. "I help Mommy pick out the vegetables. She says it's important to choose the freshest ones with the brightest colors." Once they get home, they prepare the soup -- washing, chopping and cooking the vegetables. At each step, the little girl helps her mommy. 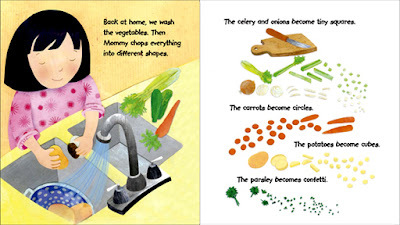 Melissa Iwai has created a story that captures the magic of cooking from a child's point of view. Her gentle tone is calming and reassuring, but she also uses clear interesting language. I read this with 2nd graders who were studying how to write "how to" instructions, and they found this story interesting and engaging. The illustrations in Soup Day are bright and colorful, and yet keep a gentle tone. Iwai has created collages with many textures of paper, and added acrylic paintings on top. This creates interesting, engaging pictures with many small details that children will enjoy. 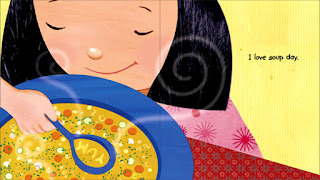 My students especially loved the ending, where the little girl tasted her soup with the alphabet pasta in it. Soup Day is a yummy treat, indeed! For more about Melissa Iwai, I really enjoyed reading her guest post at Cynsations. She also has a wonderful blog called The Hungry Artist, which celebrates her love of cooking and painting. All pictures shared here are copyright Melissa Iwai, 2010. The review copy was kindly sent by the publisher. If you make a purchase using the Amazon links on this page, a small portion will go to Great Kid Books (at no cost to you). Thank you for your support! Each Monday, children's book lovers gather together on the Internet to celebrate nonfiction books. Today, I have the pleasure of hosting Nonfiction Monday here at Great Kid Books. I'd like to celebrate by sharing a book that inspired my children's creativity and helped them learn about a time and place far away from us: The Ink Garden of Brother Theophane . Although this picture book is a fictional story, it is firmly rooted in a period of history and is written to convey much nonfiction information. 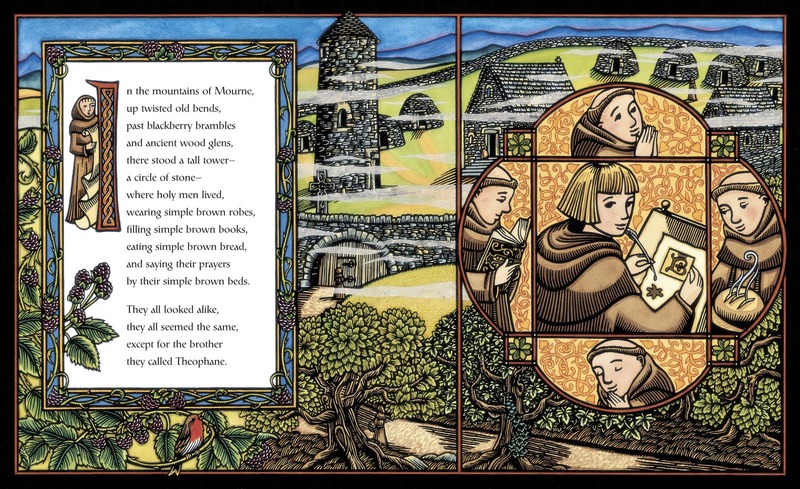 During the Middle Ages, over 1,000 years ago, monks kept alive the joy of reading and skill of writing during bleak times of war, famine, and basic survival. Monks carefully transcribed great written works - the Bible and great literature from the ancient Greeks, Romans and Arabs. They made dark ink in a variety of ways, from bark, soot and oak galls. But then they discovered ways to make colorful ink, extracting pigments from minerals, herbs, plants, and even animals. The Ink Garden of Brother Theophane is story of a young monk who, bored with simply making dark ink, starts to experiment with making colored paints for their writings. C.M. Millen has created a sweet story in rhyming verse that makes it accessible to young listeners. The adult in me wanted more of the history, and so I enjoyed reading her author's note at the end, but my young audience (1st, 3rd and 4th graders) really enjoyed the story aspect, with the rhythm and rhyming of the verse. Best of all, we all agreed, was Andrea Wisnewski's artwork. Andrea Wisnewski, inspired by the illuminated letters that the medieval monks created in books like the Book of Kells, created the artwork by first drawing each design and cutting it from dark paper. Then she has the papercut design made into a block plate which she prints on a handmade press. Finally, she adds color to the print with watercolor paint. To see more of her artwork, visit her at Running Rabbit Press. All pictures shared here are copyright Andrea Wisnewski © 2010 by Andrea Wisnewski from The Ink Garden of Brother Theophane by C.M. 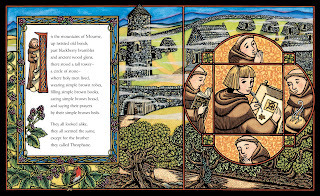 Millen, used with permission by Charlesbridge Publishing, Inc.
After reading this story, I had a gaggle of children hunting through the neighborhood for the perfect ingredients for their own potions. 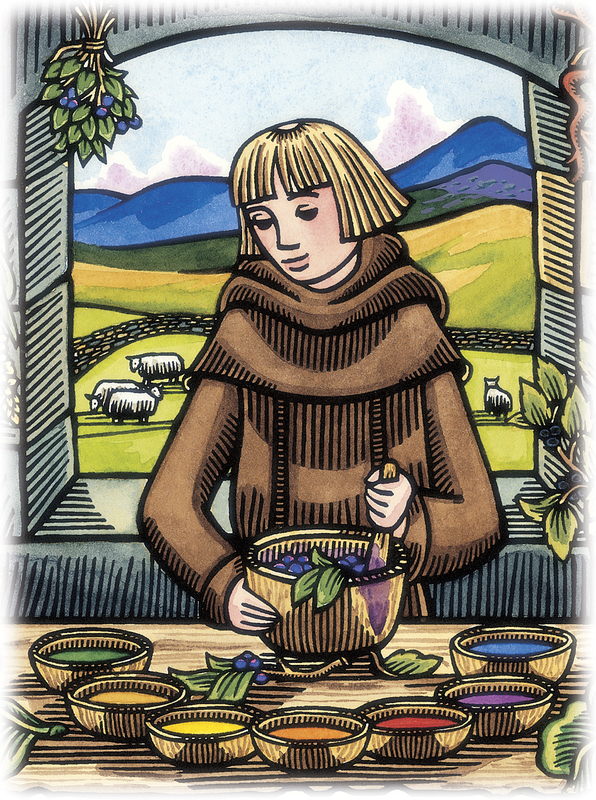 They made dark purple ink from berries, light yellow from flowers, and tried to make a green from leaves and grasses. Please share your own inspiring nonfiction finds in the comments below, remembering to leave the link to your specific post.. I will add links throughout the day. Jeff at NC Teacher Stuff is sharing Kindergarten Day USA and China , which he recommends as "an excellent resource if you want to teach young readers the skill of contrasting two or more things." I've been wanting to share this book with our kindergarten classes, and it seems very timely in light of current events! Doret at HappyNappyBookseller is sharing Saltypie: A Choctaw Journey From Darkness into Light by Tim Tingle illus by Karen Clarkson. As she writes, "Saltypie is a very beautiful book, textually and visually. Tingle's afterword is just as good. With so few American Indian children's authors, its as important as the story." At 100 Scope Notes, Travis reviews a picture book biography of Jane Goodall: Me...Jane, a picture book biography of Jane Goodall. "A woman who made important anthropological discoveries began as a girl who loved the outdoors. Me…Jane isn’t a blow-by-blow of Goodall’s entire career, but a laudable introduction and jumping-off point for young readers." I think children who are drawn to studying animals will be very interested to learn how Jane started collecting her observations of animals at a very early age. Peggy Thomas at Telling Kids the Truth: Writing Nonfiction for Children has an interesting interview with Ann Ingalls, author of Little Piano Girl: The Story of Mary Lou Williams, Jazz Legend , a wonderful picture book biography. "Mary Lou’s story is inspiring to read, but it is the authors’ choice of words and attention to rhythm that also make it enjoyable to listen to. We feel the rumble of the night train as it rolls along the tracks and we hear Mary Lou play piano." Lisa at Shelf-Employed shares a post about the Civl War spy, Sarah Emma Edmonds. The book Sarah Emma Edmonds was a Great Pretender is due out in April.Lisa writes, "Jones does a fine job of distilling the life of this complex woman into a hero story that can be easily understood by younger readers. The basics of the war are explained, but the war is not the story here. Sarah Emma Edmonds is the story; children should find her bravery and cunning fascinating." Angela at Bookish Blather reviews Smart Pop's next contribution to the world of pop culture criticism: The Girl Who Was on Fire, "13 YA authors tackle The Hunger Games trilogy, looking at topics as varied as the roles of fashion and the media, to politics and PTSD. There is some really serious stuff in here, which shouldn't be surprising to anyone who paid attention to more than the (gag) love triangle in the original books." Available in April, this definitely sounds like an interesting, academic book with a critical look at this series. This week at Abby the Librarian, Abby is reviewing an adult title with YA crossover appeal: A Pearl in the Storm by Tori Murden McClure. As Abby writes, "Tori Murden McClure was the first woman to row solo across the Atlantic.Yeah. She rowed. Solo. Across the Atlantic Ocean. As in, a rowboat. 3,333 miles. By herself. Through storms. With sharks and whales and jellyfish. She is pretty awesome." This definitely is going to draw in teen readers searching for adventure. Brenda at Proseandkahn has a review of the audio of They Called Themselves the KKK, by Susan Campbell Bartoletti. I found Brenda's review very interesting - I love audiobooks, but have never tried nonfiction on audio. "The genius with this production is that there is a bonus disc of all the illustrations, complete with captions... The author interview is also a valuable source for both social studies and language arts teachers to bring alive the research process. The story behind the story was as compelling." Read her review for more about the narrator's performance and other background materials that come with the audio disk. Jennifer at the Jean Little Library shares her review of The Real Vikings by Gilda and Melvin Berger. The authors "present a simple, but detailed introduction to the Vikings in this National Geographic history. The text is illustrated with maps, photos of archaeological artifacts and contemporary images, and decorated with a layout taken from 17th century Icelandic manuscripts." Heidi at Wild About Nature is sharing More Life-Size Zoo, a sequel to the wildly popular Life-Size Zoo. "Komiya’s newest release offers readers another chance to view amazing eye-popping photos of wild animals, many with fold out pages." Heidi has a great review of this book, describing a wide assortment of the different photographs. Afternoon update: so many more to share! Janet Squires is sharing Animal Heroes: True Rescue Stories, by Sandra Markle. "Markle's stories, based on interviews with the survivors, provide little known facts about each personal experience and are exciting without the sentimental overtones sometimes common in animal stories." This looks like a book that will draw a lot of children in! Over at Nonfiction Monday, Anastasia Suen is sharing Jimi Sounds Like a Rainbow: A Story of the Young Jimi Hendrix by Gary Golio (Author) and Javaka Steptoe (Illustrator) again because it is a 2010 Coretta Scott King Illustrator Honor Book. Hooray for a book with amazing illustrations!! At Bookends, Cindy and Lynn write about the wonderful How the Sphinx Got to the Museum by Jessie Hartland.I've had my eye on this one, so it's great to hear their take: "The focus group was fascinated by this peek into the the backstage workings of the museum. Hartland’s charming comic illustrations and intriguing graphic text made this truly unique book a winner!" It's a battle, over at Wendie's Wanderings, as she looks at Cats vs. Dogs, a National Geographic Reader by Elizabeth Carney. "This argument has been going on for over 9,000 years and still isn't settled. Which pet do you think is better -- Cats or Dogs?" Kids will love this - what a great, fun reader for them! Looking for more? Loree Griffin Burns shares a great list of her favorite nonfiction titles, both from this year's award lists and her own favorite reads. Thanks for pulling these together! Charlotte is also taking a trip to the museum over at Charlotte's Library, and is admiring How the Sphinx Got to the Museum, by Jesse Hartland. Maybe she'll run into Lynn and Cindy at the Met? As Charlotte explains, "Hartland starts with specific question--how did the battered and broken sphinx of the Pharaoh Hatsheput get from a pit in Egypt to the Metropolitan Museum of Art?" I liked the way Charlotte described leaving this lying around the house, hoping to tempt her son into casually picking it up. Stacey Loscalzo has shared how how a baseball book has brought her daughter and husband closer together. They both are avid Yankee fans and take turns quizzing each other on obscure Yankee history or current statistics. Len Berman’s The 25 Greatest Baseball Players of All Time has grabbed their attention, as they've poured over sections on famous ball players, pictures and random facts together. What a great thing to bond father and daughter! At Rasco from RIF, Carol is sharing a wonderful opportunity for all of us to join RIF in their special RIF LIVE event on Tuesday, February 8, in celebration of African American History Month. Leland Melvin, NASA’s Associate Administrator of Education and a former astronaut, will share his experiences traveling in space and read aloud The Moon Over Star. Thanks for sharing so many great books! The review copy of The Ink Garden of Brother Theophane was kindly sent by the publisher. If you make a purchase using the Amazon links on this page, a small percentage will go to Great Kid Books (at no cost to you). Thank you for your support! Happy New Year! Happy Cybils finalists!